Failing to Shred Might be Illegal! View Print and Finishing Solutions book binding for your bindery needs. Because we purchase in large volumes, we can offer our shredders to you at the lowest prices -- Guaranteed. This isn't just a claim, it's a promise. Find a lower advertised price from an authorized dealer and we won't just match it, we will beat it! Be careful of buying products from web sites that may not be authorized by the manufacturer. Purchasing a paper shredder from us entitles you to a full manufacturer's warranty, on every product, anywhere in the nation. We have been a member of the Better Business Bureau since our company's inception in 2000. The BBB gives us an A+ rating (highest available), which they define as "exemplary." Read more. We aren't a fly-by-night operation or a two-person, internet-only company. We have a 14,500 square foot commercial facility, and a team of 30+ employees. (Read more about our company.) We know that post-sale support is important, and we'll be right here when you need us. Office superstores offer cheaply-made paper shredders that are made for light use in home offices, not commercial environments. Our machines are industrial grade, precision-engineered, and built to provide years of reliable and efficient operation. 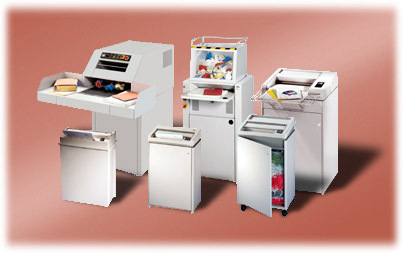 We have many decades of combined experience, selling and supporting Olympia, Intimus, and Destroyit paper shredders. Just call us at (888) 286-1242 and we can give you the guidance necessary to help you make the right purchase for your business. We pay your sales tax on any office shredder, anywhere in the United States. Remember, there is never an additional charge for shipping/truck delivery of paper shredders anywhere within the continental United States. No minimum order required.